Please prepare to sing a 16-32 bar cut of any pop/rock song, which can be from Spring Awakening or any pop/rock song (i.e., it does not have to be from a musical). If you bring sheet music, a pianist will be provided, or you may sing a cappella. You will also be asked to read a scene, which is included in the audition packet. Audition packets and sign up sheets will be available in the FTT Department Office, 230 DeBartolo Performing Arts Center, on Monday, January 15. 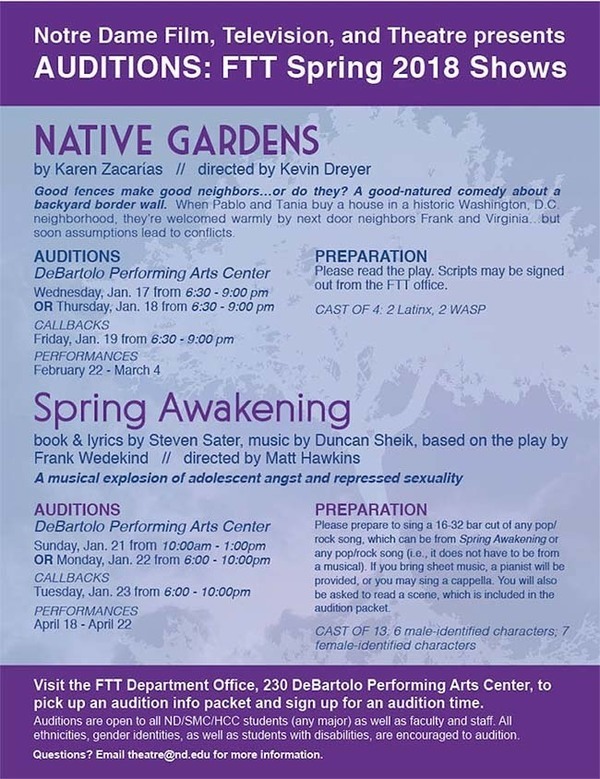 Auditions are open to all ND/SMC/HCC students (any major) as well as faculty and staff. All ethnicities, gender identities, as well as students with disabilities, are encouraged to audition.